Of the eight remaining players at the final table of the 2012 European Poker Tour Main Event in Deauville, France five of them are Frenchmen, but the biggest name still in the hunt for the over $1 million first-place prize-money is Italian poker player and Team PokerStars Pro member Luca Pagano. Nearly equaling last year’s attendance number (889 entrants in this go round compared to 891 entrants in 2011) the EPT Deauville is the first major tournament of 2012 to not see a significant decline in attendance, a good sign for the EPT and the poker world in general. Pagano entered the fifth day of the tournament as the chip-leader with over 3.5 million in chips, but was unable to keep the momentum going, ending the day with just over 2 million in chips –ending the play-down day with less chips than you started with is usually a recipe for disaster and a ticket to the rail, but it just goes to show you why building a big chip-stack can not only let you push around your opponents, but can also let you live to fight another day! As we told you yesterday, Pagano is one of the most decorated players in EPT history; with his current achievement in Deauville the longtime Italian tournament player has secured his 20th EPT Main Event cash, and is appearing at his mind-numbing 7th EPT final table! The players will have a lazy day on Monday as the final table is not set to begin until 6PM local time, where we will see who walks away with 8th place prize-money €67,200, and who walks away with the lion’s share of the prize-pool, the €875,000 set aside for the winner of the event. 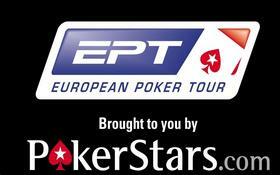 You can watch a live feed of the final table at PokerStars.tv. When the remaining players head back to the poker tables they will be playing with 40,000/80,000 blinds and a 10,000 ante, which will put a lot of pressure on the shorter stacks, as even Pagano, with just over 2 million chips is approaching the dangerous 20 Big Blind stack-size. Check back tomorrow for a complete report on the final table and to see who was crowned the 2012 EPT Deauville Main Event Champion. This entry was posted on Monday, February 6th, 2012 at 9:21 am and is filed under Poker News. You can follow any responses to this entry through the RSS 2.0 feed. You can leave a response, or trackback from your own site.